Provides a simple, user-friendly solution for companies who have aseptic pouch product needs. The Scholle IPN SureFill® 100P Aseptic filling machine is a four head, automatic filler that requires one operator. 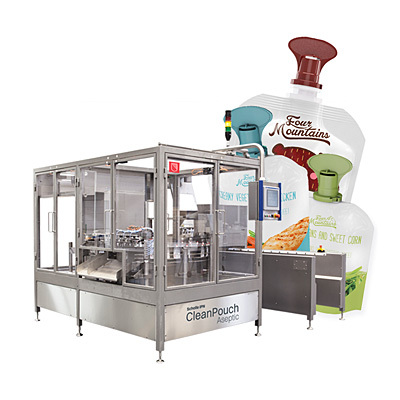 The machine is capable of packaging low-acid, high-acid, and extended shelf life products in 2- to 12-ounce pre-made pouches. The filler is equipped with a monitor interfaced to a programmable controller assuring low acid aseptic conditions during sterilization and filling operations. All product contact surfaces are constructed out of 316L stainless steel and food grade construction. This system has visual warning indicators, a messaging system that displays fault condition(s) and, if necessary, stops the filling operation. In addition, if necessary, product may be automatically diverted away from the filler with messaging to upstream processing control.